I was lucky enough to get my hands on a pair of the Victoria Beckham pants at Target on sale (hooray for me) after spotting them on a rack in the wrong section. They were actually a size too big so I took them to my tailor to have them altered and now they fit like a glove. I love how vibrant this pink is, almost like it jumps out at you which is way I was immediately drawn to them. And the front pockets were a win with me, I just love the look of them. 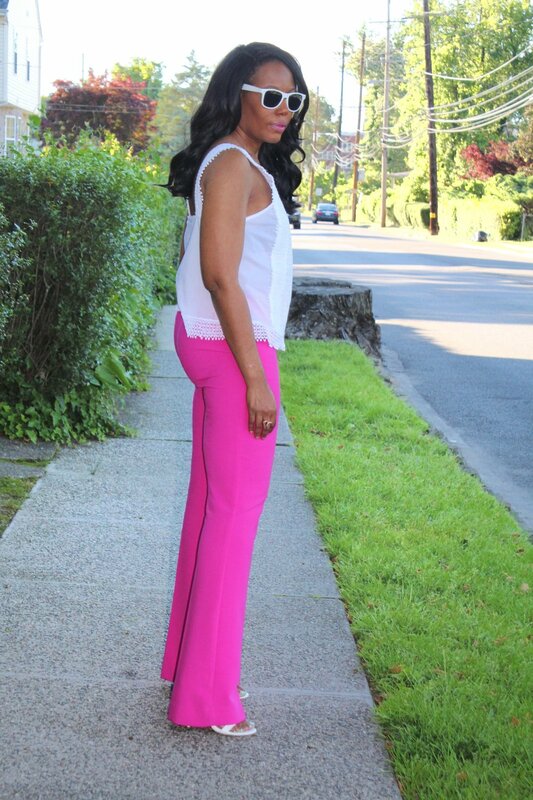 When it came to styling these pants, I decided to go with a white bare shoulder top. The details in the front has eyelet lace and pretty crochet lace around the sides and bottom, I also purchased this at Target from the Who What Wear collection. I completed this look with my white ankle strap sandals. Now I wore these pants one other time and paired them with a black top, which is a great option, and if you want to be a little bold you could also go with red or orange. Go with a top that isn’t too loose or ill fitting, you want to make sure your look is pulled together. Don’t be afraid to try color, even if it’s just one piece like my pants to test out what works for you. And if you do decide to add color try shopping at H&M, Forever21 or Target like me and not break the bank. Share how you feel about adding color to your wardrobe and if you like the color pink?